February, 24, 2014 — Due to personal reasons, The Nature Boy® Ric Flair® has had to postpone his planned trip to the UK and as a result will no longer be appearing at High Stakes 2014. Mr. Flair was very much looking forward to meeting all of his fans in the UK, however an unavoidable situation has meant it necessary for his trip to be postponed. Whilst of course we are disappointed to postpone Mr. Flair, we are extremely excited with the opportunity that this situation has created as working alongside Mr. Flair’s agents Legacy Talent and Entertainment, we believe that we have been able to bring in a fantastic and exciting talent. A former WCW World Heavyweight Champion, an Icon in the sport of professional wrestling and a man who quite simply needs no introduction: STING®! Sting will be present on Friday March 14th for ‘An Evening With The Stinger,’ and then on Saturday March 15th for an exclusive photo session followed by an appearance at High Stakes 2014. All tickets for the previously advertised Ric Flair events will be honoured for the Sting events. 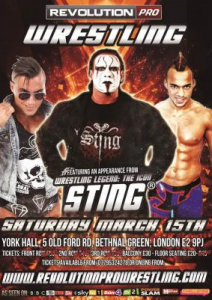 London, you have been put on notice, the master of the Scorpion Deathlock is coming and we can’t wait!